Last year I saw Katy making lovely pillowcases on Instagram and decided to copy her. I hunted about for a tutorial but couldn't find one that seemed straight forward to me, so I figured it out as I went along. so this week I've sewn the last ten. Here's a simple tutorial to show you how I did it. For two pillowcases you need one metre of main fabric, half a metre of contrast and 10 cm of a trim. It works out more economical to make two at once. Fold the main fabric in half by putting the selvedges together. Cut the folded piece into two 50cm (19") pieces and trim off the selvedge. Cut the trim into 2.5 x 50 cm (1 x 19") pieces and press in half lengthwise. and sew it down. Press. making sure that the trims line up at the seam. Neaten the edges. Neaten the top raw edge and fold under 5mm (1/4") and sew down. 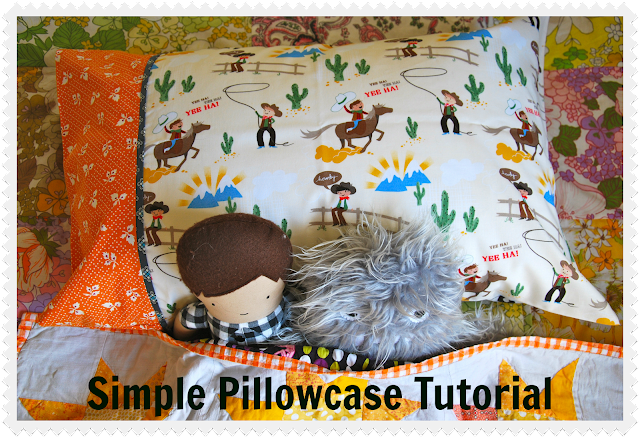 Turn the pillowcase right side out and fold in the top six inches or so creating a flap on the inside. I usually just check with a pillowcase or the pillow it is going to fit. Very carefully top stitch down each side seam just long enough to hold the flap. Press, pop a pillow in and you are done. It's as easy as that. It's all neat and tidy which is important to me. sometimes its hard to put actions into words!!! I really need to do this! That piece of trim really helps to break up between the print and contrast. Love that pillowcase - Love the idea - it's one that I've used many times! LOve it! I just copied a real one when I did mine and there was a bit of back tracking (and swearing!) Will keep this tutorial and yes, makes perfect sense!